In case you couldn’t tell, I love the color blue. For as long as I can remember, blue has brought me joy. In this colorful world, those calm and peaceful blues always capture my eye first. That’s why it has been such a pleasure to immerse myself in creating a batch of blue eggs these last few months. 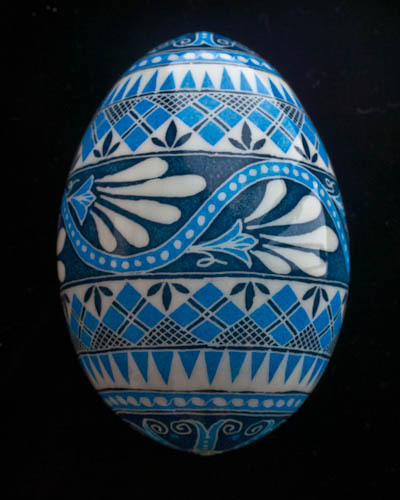 In order to stretch myself artistically, I chose a limited number of simple design elements yet combined them uniquely for each egg. What do you think? While working on my website yesterday I saw an announcement asking if I’d like to “get posts sent directly to you via instant messenger” and that started me thinking. Just how fast do I need to get posts? I mean, do I really need to know instantly when a new post is out there for me to read? No one would deny that we live in a fast-paced world. Everything today is fast… email and instant messaging make the postman unnecessary… microwaves cook our food in minutes…online shopping can have your purchase on your doorstep overnight…digital photos go instantly from camera to computer to printer…and the list goes on. We just don’t know how to slow down anymore. Nor do we want to. It feels like life speeds up with each passing year and there’s no way to stop it. 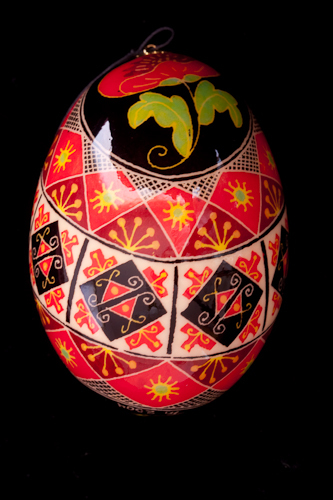 And yet I find I crave the slowness found in the art of pysanky. Everything about it is slow, from melting the beeswax in the kistka to waiting as the egg sits in the dye to working layer by layer, color by color toward the finished egg. My soul grows bigger as I watch a design emerge, wrapping another egg in elaborate colors. This is where slow is beautiful. And that’s a good thing.